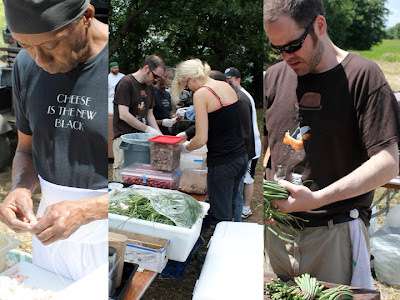 Last year when I visited my parents in Connecticut, one of the restaurants we ate at was participating in a Farm to Table event where they went to area farms and put on a dinner featuring the local produce and helping increase awareness of local farms. I was intrigued by it and was disappointed that the event was happening after I left. Then a month or so ago, The Corner Table, one of the restaurants I had visited with the Minnesota Food Bloggers sent out a request for volunteers to help with their Tour de Farm events. I knew I wanted to help out and arranged to take a day off work to go and participate. 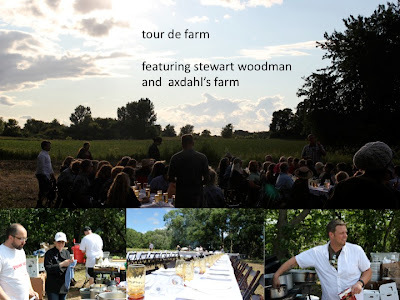 So earlier this week, I drove to the beautiful Axdahl farm in Stillwater Minnesota and spent the day half a mile or so into a cornfield setting up a makeshift restaurant and serving 60 guests a meal they are all sure to remember. The day began by trekking through the cornfield and unloading all of the supplies, tables, chairs and portable cooking equipment. The fires were started and tables and chairs began to form the basis of our farm restaurant. Soon after, the Chefs and team arrived from Heidi's Restaurant in Minneapolis, the featured team for this event. They got right to work prepping for dinner and while they didn't look as comfortable working at folding tables as they did when I saw them in their own place a few weeks ago, they seemed to to get right in the groove of things. It was a lot of fun to watch them getting everything together and smelling the aroma's floating around the site. We set the tables while fighting gusts of wind that required constant resetting and chasing down blown napkins. My primary responsibility was in the main dinner area, while another group worked on setting up the reception area closer to the parking area. Soon, guests started arriving from the reception area and we went to work on serving the amazing meal the Heidi's team had put together. I didn't get many pictures once the guests arrived and I don't even know the details of each course but they included a duck confit, lamb, trout, fresh donuts and even ice cream made on site in front of the guests with liquid nitrogen. We nibbled on extras throughout the night and I ate a significant portion of the extra donuts. Noah even pulled out a container of fried chicken he had made the night before (he only eats it cold of course) and it was soon devoured as well. The food was simply amazing especially considering the circumstances in which they were made. In the end I was exhausted but it was a fantastic experience. The group of chef's, organizers and volunteers were all so much fun to work with. I miss working in the restaurant scene and I think I'll definitely participate again. After the guests left, it was time to pack up and leave things how we found them. It was a beautiful area and the sunset made a perfect ending to a wonderful day. Lovely post. What a great experience. I want to eat dinner in a corn field!